Rogier Kievit is a Programme Leader Track scientist at the MRC Cognition and Brain Sciences Unit, researching lifespan development of cognitive abilities. His first child was born in the Netherlands in 2012 during his PhD studies, for which he was allowed to take three days paternity leave. Later that year, he moved to the UK to start a postdoc. His second child was born in 2015. I come from an academic family: my father was a professor and surgeon, and my mother has worked in a lab and currently works at a scientific institute. However, I never felt any pressure to follow in their footsteps – I was simply passionately interested in a range of topics. I wanted to study cognitive psychology at about 15, as I was fascinated about the relation between mind and brain, but I would have been just as excited to study paleontology, physics or biology, there are so many fascinating topics out there! The fact that you can work on questions to which no one knows the answer is most exciting to me, and I value the global kinship among scientists regardless of their background. I did my undergraduate degree in psychology and some philosophy at the University of Amsterdam, including half a year spent at the University of Otago in New Zealand. This was followed by a master’s degree and a PhD, both in Amsterdam, including 18 months spent in Boston at Harvard University, where I learned a lot about experimental design, testing, analysis and software. We had our first child in 2012, right before leaving for the UK, where we both found a postdoctoral position. In the last few years, we were both lucky enough to secure independent funding to start our own labs. I have been a Programme Leader Track scientist in Cambridge since 2015, closely collaborating with labs in London and Berlin. We study neurocognitive development across the lifespan, with a special interest in periods of rapid change such as childhood and old age. My wife Anne-Laura van Harmelen (A Royal Society Dorothy Hodgkin fellow at the Department of Psychiatry at the University of Cambridge) and I are both scientists. 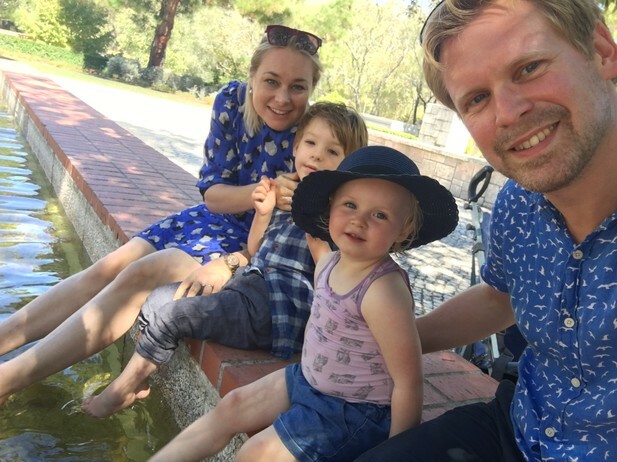 With our first child, our plan was to move from the Netherlands to the UK for the final few months of pregnancy while I finished my PhD, and to start my postdoc after paternity leave. But as is often the case, children have a healthy disregard for parental plans. Our son was born nine weeks early, days before we were supposed to leave for the UK. Instead of moving, we spent a hectic few months living in an empty apartment visiting our son in hospital, whilst setting up logistical challenges in the UK (bank accounts, rental house) from afar, but we made it through and moved December 2012. The Netherlands has surprisingly poor paternity and maternity leave. I only received three days (! ), which didn’t take into account that my son was born early, so technically I would have had to go back to work while he was still in the intensive care unit, weighing three pounds. Luckily, I was in the writing-up phase and had no other duties (such as experiments). Perhaps surprisingly, the UK has far more generous leave (two weeks). On the day I handed in my PhD thesis, our son, then aged one, became very ill with severe seizures. This was the beginning of (another) several months in hospital with a variety of symptoms, most notably severe epilepsy. Ultimately, he was diagnosed with ring 14 chromosome disorder, an extremely rare genetic condition associated with severe disability. Quite the shock, as you might imagine. Luckily, both my Dutch PhD supervisor and my new professor in the UK were very understanding. Throughout, the healthcare in the UK was excellent. Several years later, we had a daughter, now aged two. Time. No matter how consciously you try to make decisions, it can feel as if you never do enough, trying to balance being a parent, a partner and a scientist. Also, juggling two academic careers in a challenging job market is not easy. Although much progress has been made in recent years, I think many common real-life situations are poorly catered for. Miscarriages, IVF, adoption, inability to conceive and various physical and mental health consequences of pregnancy, especially for the mother, are incredibly common, yet almost nothing is in place to support people in such situations. One practical (but only partial) solution is to have (postdoc) contracts that are sufficiently long (two, ideally three years) to accommodate such eventualities. Stringing together short-term contracts, sometimes whilst in the midst of maternity or paternity leave, is not sustainable. More generally, job (in)security probably takes the biggest toll on early-career scientists. The inability to plan for the longer term, including often not being able to secure a mortgage, makes it hard to accommodate children. Moreover, these things often happen during the most vulnerable career stages. Until we start talking about these challenges and try to find practical solutions, it will remain common for both men and women to quit science in favour of something more reliable. Similarly, moving countries or cities to experience other labs – although certainly an enrichment – should never become a necessity, because sometimes people simply can’t or won’t move for reasons they might not want to discuss. It’s never a good time, and it’s always a good time. The one thing that makes parenthood different from many other aspects of life is that people seem to give you unsolicited advice about everything. So, if I might ironically violate my own advice by giving guidance: try your best to not listen too much. Being a scientist is a relatively ‘good’ career to combine with children. First, having a child makes one far more efficient and focused on the things that truly matter. When you have to cram the same duties into fewer hours, you quickly become more rigorous in saying no and more focused on finishing things. Second, as a scientist you are generally far more flexible in terms of working hours, which is very helpful with the unpredictability that comes with children. Our situation is probably a bit different than most, having a severely disabled child with a rare condition. This is hard in any career, but in many ways, being a scientist makes it easier. You can work anywhere (at least in our field), which enabled us to work flexibly while we spent five months ‘living’ in hospitals. Although one might think that work would be far from your mind, it was actually a welcome distraction and gave us a sense of ownership and control that we otherwise wouldn’t have had. For many people, being a scientist is part of your identity, and doing some work despite challenging circumstances helped us to feel less isolated. We even submitted our fellowship applications from the hospital. In our specific case, work and life started to intersect in surprising ways. You suddenly see articles about epilepsy or the effects of prematurity in a very different light, realizing the human stories behind the science. Our son’s successful treatment was even published as a case study. Being a scientist also helps with our son’s care, as we are in a position to keep an eye on some of the newest studies about his rare condition.